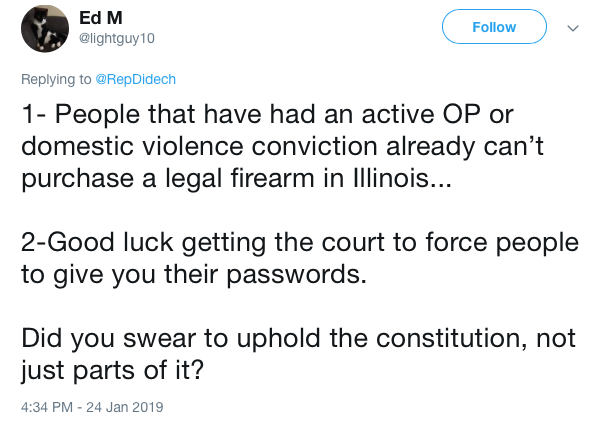 Defenders of the Second Amendment might have a problem with a new bill introduced in the Illinois State House that would require Illinois residents to “reveal their public social media accounts to Illinois police before they’re approved for a firearm license,” according to CBS 2 - Chicago. Illinois State Rep. Daniel Didech (D-Buffalo Grove) recently introduced bill HB 888 to the Illinois House of Representatives. The bill was introduced in January, but is now receiving local and national attention. HB 887 would close a loophole that allows convicted stalkers to come to Illinois and purchase firearms. “A person’s political beliefs, a person’s religious beliefs, things that should not play a part in whether someone gets a FOID [Firearm Owner Identification] card,” Glenberg also said. But, Glenberg wasn’t the only one upset about the proposed bill. “When people look at this everyone who has a Facebook account or email account or Twitter account will be incensed or should be,” Illinois State Rifle Association representative Richard Pearson said.